This is going to be somewhat personal, a little mushy, and definately a violation of Jen’s blogging rules for her site. Sorry Jen! I had to hack into Jen’s Blogger account and post to her site. I want everyone in Jen’s blogosphere to know how proud I am of her! This morning Jen finished her first half-marathon. To make this even more amazing, you should know that she injured her foot a couple of weeks ago and has been struggling with some very painful Plantar Fasciitis. She took a break from training two weeks ago, and on Wednesday she went out to test the injury on a run. After a very painful mile, she decided she wasn’t going to attempt the half-marathon on Saturday. This REALLY bummed her out, as she had spent the entire summer training for this event. However, on Friday she decided she would wrap her foot and give it her best shot! My wife is tough! 13 miles is a LOOOONNNNGGGG way. Rachael, Megan, Ethan, and I decided we would drive the van along the route so we could cheer her on. I was really amazed at how well she did. At the half-way point, she ran up and gave the girls a high-five and a big smile, BUT, I could tell from the look in her face that she was in a lot of pain. At about 10 miles, she started to show the pain in her face, and I started to worry. 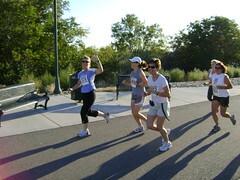 She slowed her pace slightly, and dropped back from her running partners. When she passed us at mile 11.5, she had quite the grimace … both Rachael and Megan both commented that they were worried about her. They were both getting upset … but she kept going. She ended up finishing the entire half-marathon without walking. I couldn’t believe it … since she had just planned to start the race, send her training partners off to a good start, and quit after a mile or two. Umm…if I looked as good as you in Spandex, I’d be begging for Jared to take photos of me!! Congrats on the half-marathon…WOW!!! I just bought new running shoes (my old ones from college were trashed, and I’ve been using that as an excuse not to run for years! ), and perhaps I’ll one day be able to do a half of a half marathon…ha!! Oh, and I missed “The Office.” Did you tape it?! We only just discovered it this summer (hello! Yes, I know we’re behind…). HYSTERICAL! Name the date, and we’ll be there! Maybe we could combine it w/an episode of The Office, since we got jipped out of our last one. btw: Did everyone else think the premiere was as funny as I did? Phyllis is my new favorite! Jen! You did it! I am so proud of you and so jealous!!! I would have loved to have done that together, but no worries…we have hood to coast to look forward to and a long time to pray for feet free of disease. I really hope you are healing well. Way to go!!! Didn’t you and I watched it together in 6th grade? And this may sound strange, but I have the very movie at my house. via netflix. It was mentioned in stake conference a few weeks ago and I thought I ought to rewatch it with a more mature perspective. The only thing I remember is men running on the beach. Like I said, it’s been here a few weeks, unwatched. Funny you mentioned “Chariots of Fire.” When I thought about blogging this myself (before my hacker hubby got to it) I considered that for the title, but then decided “Misery” suited better. Jen, you are my hero! Seriously, I am so proud of you! I have to admit I teared up reading that post. Derrick is a good man. And you: my hero. how do I obtain the will to run? I really really really want to have that desire. did you watch Chariot’s of Fire to kindle that running spirit? what is the secret? There are only two words to describe you Jenn…AWESOME and AMAZING! And Derrick has hacking skills…I didn’t know that. And Derrick, I love you, but you are sooo in trouble for a)posting on my blog behind my back, and b)posting a PHOTO OF ME IN MY SPANDEX for the eyes of the whole world to see! I was mad that you brought a camera in the first place; little did I know the evil designs you had for it! Truly cruel. But, since you bragged so beautifully about me, I’ll let it go this once. At least it was a side shot. A rear one would have scared off my online audience for life. I’m sublimely happy that this thing is over and my stupid foot can finally heal. Thanks for all your support, D! And for the sweet post. Did you ever know that you’re my hero? You’re everything I wish I could be. And I could fly higher than an eagle, cause you are the wind beneath my wings!!!! Seriously, you are amazing. I would have been jumping up and down when I got injured to know that I had a legit reason not to run. But not our Jen… You rock! I am so glad that my daughter has you to look up to as a strong and determined woman. Love ya! Congrats to you and Cara, you guys are amazing. I know that you guys were a lot at church, but you DID IT! Hope your feet feel better soon! I am not sure I would want to bike a half marathon let alone run it. I want to see some video! You are amazing! I am so glad you married my brother so I can be related to you!!! Thanks for posting Derrick! I hope you start healing now!! You are both inspiring as I work out a little everyday!! Love you guys! You amaze me!!! I have been working towards running a half marathon next Spring…but I have a long ways to go!! Your determination is inspiring. Heal quickly! **Derrick…great job with the post!